Kissy bought the second generation Apple TV when she was in Canada last week, so the geek has a new gadget to play with hehe! Despite the fact that the feature of renting TV Shows and Movies is not available (yet?) in Norway, this nifty device is already giving me lots of pleasure…it is simply a great way to stream my music, photos and movies from any computer at home to my TV and stereo (no DivX yet, but with a jailbreak on its way that will come sooner than later 😉 , next to that I expect Apple to take the App Store route since the Apple TV is iOS based…VLC will definitely be there!). Next to that it provides instant access to YouTube, Flickr, MobileMe, Podcasts and 100’s of Internet Radio stations. So far, so good, but the most amazing feature is AirPlay; the setup, ease of use and (future) options are many…it’s very cool to see it live in action (check out this video to get an impression). And all of that in a really, really tiny box (less than 10x10cm)…you can see that it is small from the photo below, but I didn’t realize how tiny it really was until I took it out of the box. 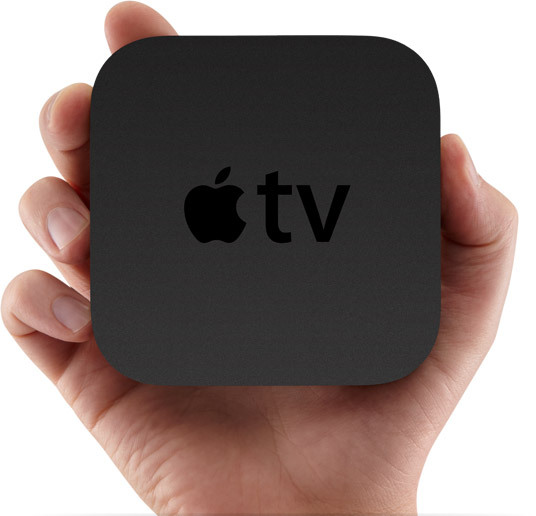 Unlike the previous generation of Apple TV, I expect this one to be a hit, it’s already a great addition to my Apple gear at home!